Minutes is a work in progress that takes the freely available notes of the 1884 International Meridian Conference as a starting point for a film and performance work that re-imagines the Conference through collective action. 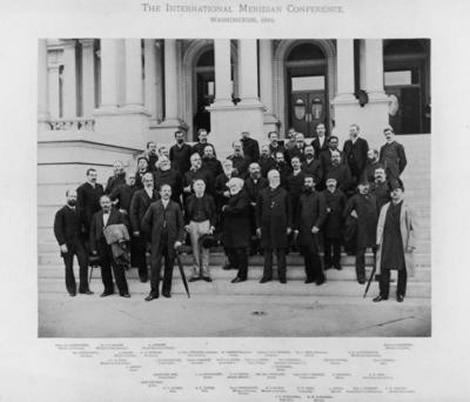 1884: the year time stood still – or, more accurately, the year an international conference agreed there should be fixed meridians, universalising time zones and paving the way for clearly connected global communication and travel. 41 delegates of 25 countries met in Washington, USA, in October, and after eight days decided Greenwich should be the prime meridian and set the baseline for the Universal Day. The minutes of the conference are freely available, and record almost word-for-word the conversations of those eight days. Recently I have transposed the originally third-person notes into a script entirely faithful to the original. 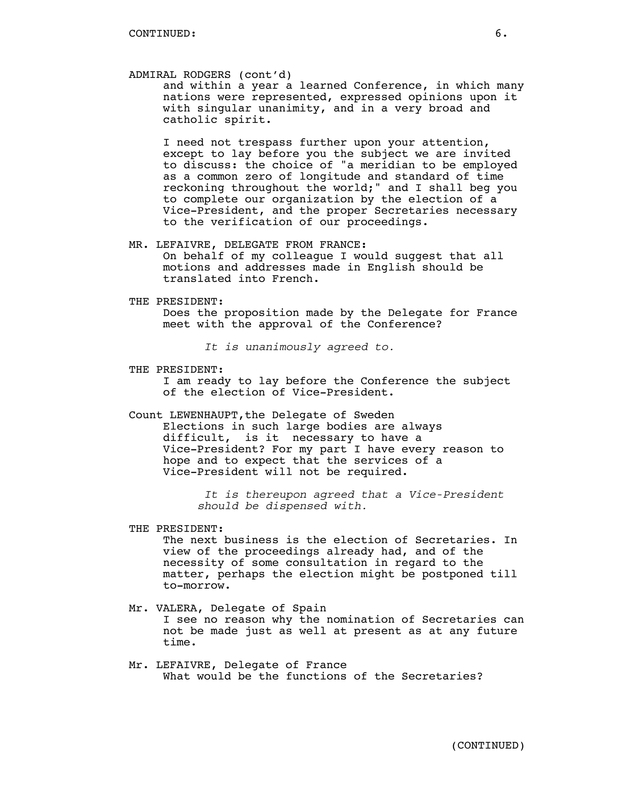 Already almost a script in themselves, the notes detail the minutiae of the conference, the characters and personalities of the delegates both as individuals and as representatives of their countries and political situations of the time. The idea of the Universal Day and Prime Meridian seem somehow fixed and infallible, measures of indisputable time and space. The conference’s decisions, though informed by scientific facts, are shown being made by fallible, idiosyncratic individuals, making fundamental decisions of impact to people across the world. Minutes takes the notes of this conference and put them into the mouths of groups of people coming together now. Rather than a re-enactment, it channels the words of the 1884 delegates through readers who are themselves in all but the words the say. With only a text document to go from, there are many decisions for the readers to make. Early on in the process, the reading group make decisions over the interpretation of certain phrases and collective actions – e.g. calls to order and votes, as well as situational elements e.g. furniture positions. Some of the 41 delegates speak regularly, making short comments or long scientific presentations. Some delegates never speak, but all are present and take an active part in decision making. By turns the script is dry, politically telling, of its time, universal, funny and drearily boring. I’m interested in capturing all of these elements, alongside the unique personalities of each group that read, and the decisions they choose to make.